Most organizations for standards and certification were established by groups of companies in the industries having to meet those standards. However, Allergy Standard Limited (ASL) was not started by industry executives, but by physicians specializing in the treatment of asthma and allergies. Although ASL is composed of physicians, it has recruited operational executives with proven corporate and technical experience. Physicians still govern the organization. ASL is a global organization. It began in Ireland in 2006, and is headquartered there. It has merged with like organizations in other countries, such the Asthma and Allergy Foundation of America in the United States and the Asthma Society of Canada (now Asthma Canada). We are a physician led global certification company that prepares independent standards for testing a wide range of products to determine their suitability for asthmatics and individuals with associated allergies. To meet this goal, they have developed means of testing consumer products to see whether they have low or no risk of triggering allergies and asthma attacks. Products which meet these criteria may be certified as hypoallergenic and bear the asthma & allergy friendly® mark. On their website, the words asthma and allergy in the certification mark (asthma & allergy friendly®) link to explanatory texts in the glossary. ASL has certification standards for 19 categories of products. The most extensive category is Bedding, which has 24 sub categories. Of particular interest to Memory Foam Mattress.Org are those concerning mattresses and pillows: the Mattress Standard, Mattress Encasing Standard, Pillow Standard, Pillow Encasing Standard, and Feather & Down Filled Pillow Standard. Although our primary focus is on mattresses and pillows containing memory foam and/or latex, feather and down products are also a concern, since many users of memory foam mattresses may also have down or feather-down pillows, featherbed toppers, or down-filled comforters. Requirements for meeting these standards include impermeability to allergens, breathability, cleanability (for removing external allergens), and durability. They must also be free of chemicals which trigger allergies or induce asthma attacks. Allergy Standard Limited has a “Testing and Certification Policy” established for the purpose of complete confidence by the public as well as by governing bodies in their testing, their verification of claims, and their certification program internationally. Concerns addressed in this policy are impartiality, expertise and competence, up-to-date procedures, fair and equitable resolution of complaints and disputes, and appeals to decisions. Six international laboratories are ALS Testing Partners. Three of them concern mattresses and pillows: Airmid Health Group, SGS, and Testex. 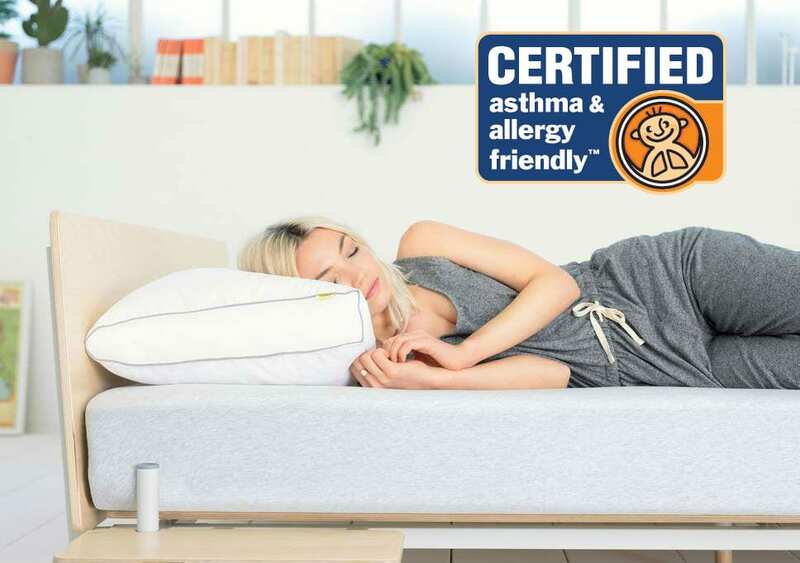 They not only test fabrics, but also test latex, memory foam, wool and cotton batting, down and feathers, and other internal ingredients of pillows and mattresses, if the manufacturers using these request asthma & allergy friendly® certification. ASL also works with academic research institutes (universities), such as Trinity College Dublin and Dublin Institute of Technology. ASL lists products which have the asthma & allergy friendly® mark. The category Bedding includes Blankets, Comforters and Duvets, Mattress Encasings and Pads, Pillow Encasings and Protectors, Pillows, Sheets and Pillow Cases, and Waterproof Bedding. Most of the manufacturers of ASL certified bedding are also members of the American Down and Feather Council (ADFC). Allergy Standard Limited calls their participation in other organizations “Professional Memberships.” ASL is a member of The British Standards Institution, Vacuum Dealers Trade Association, Home Fashion Products Association (parent organization of ADFC), Industrial Fabrics Association International, American Association of Textile Chemists & Colorists, ASTM (the American Society for Testing and Materials), The Textile Institute, and the Dublin Chamber of Commerce. Allergies have been an issue in bedding for generations. There has been wider recognition of this in recent decades than had been the case before. Common allergens are certain materials (such as natural latex and wool), chemicals, pollen, molds, and dust mites. Some memory foam mattresses also have latex. Some users of memory foam beds use latex or down mattress toppers, down pillows, or featherbeds. And down comforters are popular. Wool is sometimes used as the fire barrier, in a fabric blend for the cover, in a blanket, or in some pillows. Therefore, even though memory foam itself may be hypoallergenic, there may still be allergy concerns, either with the pillow and mattress, or with other bedding items. Modern processing of latex foam, such as Talalay or the latest version of Dunlop, rinse virtually all allergenic proteins from the latex. This means that newer latex mattresses and pillows are less of an allergy concern than their predecessors. With down and feathers, allergies are almost always not to the material itself, but to impurities and dust mites. Thus proper cleaning and sanitizing of feathers and down is the key to making them hypoallergenic. Proper care of down and feather products is also critical, and this includes in storage and transportation before they are sold to the consumer. Not keeping them dry and not drying them immediately when they do get wet increases the chance of growing mold, a significant allergen and health concern. There is a similar concern for memory foam mattresses and pillows, which is why warranties usually exclude products with stained covers. This indicates that moisture probably got into the product, increasing the likelihood of mold or deterioration of materials. ASL testing and certification applies to products at the time of manufacture and distribution. 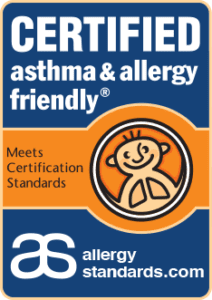 This is how the asthma & allergy friendly® mark is to be understood.